Famous Great Western Railway Castle class steam locomotive No 7029 Clun Castle will turn back the clock when it powers two forthcoming excursion trains on the Cotswold Line. Castle class locomotives hauled the express trains on the Cotswold Line between London and Worcester from the mid-1930s until the end of steam operation on the route in September 1963. 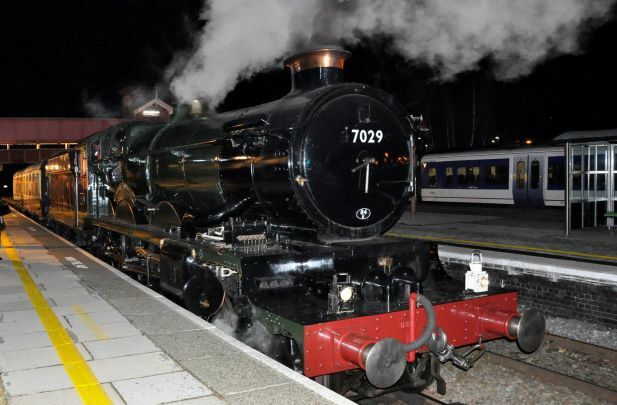 Clun Castle will be in charge of two Cotswold Explorer excursions from Birmingham to Oxford, operated by Vintage Trains, on Saturdays March 9 and April 6. The trains will run in the morning from Birmingham to Oxford via Worcester Shrub Hill, Stroud and Swindon, arriving at lunchtime, then return to Birmingham via the Cotswold Line in late afternoon. Departures from Worcester will be at 09.18, arriving at Oxford at 12.27. The return departures from Oxford will leave at 17.39, with the trains due to reach Worcester Shrub Hill at 19.13. Click here for more details of the Cotswold Explorer trains and ticket information and Vintage Trains' other steam excursions.